Montana Cans Sticker Roll 500pcs Blue This massive roll of Montana HELLO MY NAME IS Stickers is perfect for sticker fiends and retailers alike. Each of the 500 stickers has perforated edges for easy division to sell in bundles or share with the crew. Montana HELLO stickers are printed on coated paper with highly adhesive backing. 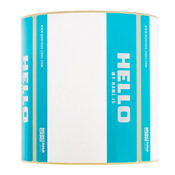 This massive roll of Montana HELLO MY NAME IS Stickers is perfect for sticker fiends and retailers alike. Each of the 500 stickers has perforated edges for easy division to sell in bundles or share with the crew. Montana HELLO stickers are printed on coated paper with highly adhesive backing.